Wake up America: How Does Barack Hussein Obama Lie to Us-Let Us Count the Ways! How Does Barack Hussein Obama Lie to Us-Let Us Count the Ways! Cross posted from Miss Beth's Victory Dance here. This came to me in my email and I was given permission to post and spread this anywhere and everywhere I can. While I am no fan of HRC, her lies are well documented in many places. Barack Hussein Obama's lies have been effectively compiled here, by Mr. Peters. I don't think this was what Barack Hussein Obama meant by the words "hope" (hoping we wouldn't get something like this put together for all to see?) and "change" (change from a republic into a socialist state is what he wants). Read, memorize, swipe and publish! 1. Selma Got Me Born. LIAR--your parents felt safe enough to have you in 1961; Selma had no effect on your birth, as Selma was in 1965. 2. Father Was A Goat Herder. LIAR--he was a privileged, well educated youth, who went on to work with the Kenyan Government. 4. My Family Has Strong Ties To African Freedom. LIAR--your cousin Raila Odinga has created mass violence in attempting to overturn a legitimate election in 2007, in Kenya . It is the first widespread violence in decades. 5. My Grandmother Has Always Been A Christian. LIAR--she does her daily Salat prayers at 5 a.m. according to her own interviews. Not to mention Christianity wouldn’t allow her to have been one of 14 wives to 1 man. 6. My Name is African Swahili. 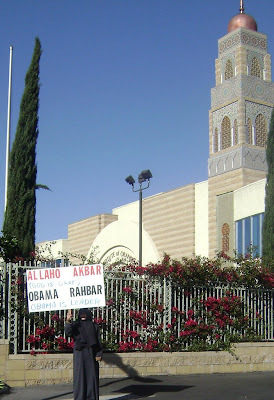 LIAR--your name is Arabic and Baraka’ (from which Barack came) means blessed in that language. Hussein is also Arabic and so is Obama. 7. I Never Practiced Islam. LIAR--you practiced it daily at school, where you were registered as a Muslim and kept that faith for 31 years, until your wife made you change so you could run for office. 8. My School In Indonesia Was Christian. LIAR--you were registered as Muslim there and got in trouble in Koranic Studies for making faces (check your own book). 9. I Was Fluent In Indonesian. LIAR--not one teacher says you could speak the language. 10. Because I Lived In Indonesia, I Have More Foreign Experience. LIAR--you were there from ages 6 to 10 and couldn’t even speak the language. What did you learn, how to study the Koran and watch cartoons? 11. I Am Stronger On Foreign Affairs. LIAR--except for Africa (surprise) and the Middle East (bigger surprise), you have never been anywhere else on the planet and thus have NO experience with our closest allies. 12. I Blame My Early Drug Use On Ethnic Confusion. LIAR--you were quite content in high school to be Barry Obama, no mention of Kenya and no mention of struggle to identify-your classmates said you were just fine. 13. An Ebony Article Moved Me To Run For Office. LIAR--Ebony has yet to find the article you mention in your book. It doesn’t--and never did--exist. 14. A LIFE Magazine Article Changed My Outlook On Life. LIAR--LIFE has yet to find the article you mention in your book. It doesn’t--and never did--exist. 15. I Won’t Run On A National Ticket In ‘08. LIAR--here you are, despite saying on live TV you would not have enough experience by then and you are all about having experience first. 16. Present Votes Are Common In Illinois. LIAR--they are common for YOU, but not many others have 130 NO VOTES. 17. Oops, I Mis-voted. LIAR--only when caught by church groups and democrats did you beg to change your “mis-vote”. 18. I Was A Professor Of Law. LIAR--you were a senior lecturer ON LEAVE. 19. I Was A Constitutional Lawyer. LIAR--you were a senior lecturer ON LEAVE. 20. Without Me, There Would Be No Ethics Bill. LIAR--you didn’t write it, introduce it, change it or create it. 21. The Ethics Bill Was Hard To Pass. LIAR--it took just 14 days from start to finish. 22. I Wrote A Tough Nuclear Bill. LIAR--your bill was rejected by your own party for its pandering and lack of all regulation-mainly because of your Nuclear Donor, Exelon, from which David Axelrod came. 23. I Have Released My State Records. LIAR--as of March, 2008, state bills you sponsored or voted for have yet to be released, exposing all the special interests pork hidden within. 24. I Took On The Asbestos Altgeld Gardens Mess. LIAR--you were part of a large group of people who remedied Altgeld Gardens. You failed to mention anyone else but yourself in your books. 25. My Economics Bill Will Help America. LIAR--your 111 economic policies were just combined into a proposal which lost 99-0, and even YOU voted against your own bill. 26. I Have Been A Bold Leader In Illinois. LIAR--even your own supporters claim to have not seen BOLD action on your part. 27. I Passed 26 Of My Own Bills In One Year. LIAR--they were not YOUR bills but rather handed to you after their creation by a fellow Senator, to assist you in a future bid for higher office. 28. No One Contacted Canada About NAFTA. LIAR--the Canadian Government issued the names and a memo of the conversation your campaign had with them. 29. I Am Tough On Terrorism. LIAR--you missed the Iran Resolution vote on terrorism and your good friend Ali Abunimah supports the destruction of Israel. 30. I Am Not Acting As President Yet. LIAR--after the NAFTA Memo a dead terrorist in the FARC, in Colombia, was found with a letter stating how you and he were working together on getting FARC recognized officially. 31. I Didn’t Run Ads In Florida. LIAR--you allowed national ads to run 8-12 times per day for two weeks-and you still lost. 32. I won Michigan. LIAR--no you didn’t. 33. I won Nevada. LIAR--no you didn’t. 34. I Want All Votes To Count. LIAR--you said let the delegates decide. 35. I Want Americans To Decide. LIAR--you prefer caucuses that limit the vote, confuse the voters, force a public vote and only operate during small windows of time. 36. I passed 900 Bills in the State Senate. LIAR--you passed 26, most of which you didn’t write yourself. 37. My Campaign Was Extorted By A Friend. LIAR--that friend is threatening to sue if you do not stop saying this. Obama has stopped saying this. 38. I Believe In Fairness, Not Tactics. LIAR--you used tactics to eliminate Alice Palmer from running against you. 39. I Don’t Take PAC Money. LIAR--you take loads of it. 40. I Don’t Have Lobbyists. LIAR--you have over 47 lobbyists and counting. 41. My Campaign Had Nothing To Do With The 1984 Ad. LIAR--your own campaign worker made the ad on his Apple in one afternoon. 42. My Campaign Never Took Over MySpace. LIAR--Tom, who started MySpace, issued a warning about this advertising to MySpace clients. 43. I Inspire People With My Words. LIAR--you inspire people with other peoples’ words. 44. I Have Passed Bills In The U.S. Senate. LIAR--you have passed A BILL in the U.S. Senate-- for Africa--which shows YOUR priorities. 45. I Have Always Been Against Iraq. LIAR--you weren’t in office to vote against it AND you have voted to fund it every single time, unlike Kucinich, who seems to be out gutting you, Obama. You also seem to be stepping back from your departure date - AGAIN. 46. I Have Always Supported Universal Health Care. LIAR--your plan leaves us all to pay for the 15,000,000 who don’t have to buy it. 47. I Only Found Out About My Investment Conflicts Via Mail. LIAR--both companies you cite as having sent you letters about this conflict have no record of any such letter ever being created or sent. 48. I Am As Patriotic As Anyone. LIAR--you won’t wear a flag pin and you don’t put your hand over your heart during the Anthem. 49. My Wife Didn’t Mean What She Said About Pride In Country. LIAR--your wife’s words follow lock-step in the vein of Wright and Farrakhan, in relation to their contempt and hatred of America. 50. WalMart Is A Company I Wouldn’t Support. LIAR--your wife has received nearly a quater of a million dollars through Treehouse, which is connected to WalMart. 51. Treehouse Is A Small Company. LIAR--the CEO of Treehouse--last year--made more than the CEO of WalMart, according to public records. 52. University Of Chicago Hospital Pay Is Fair. LIAR--your wife’s pay raise was nearly 150% her already bloated rate and the hospital is a Non-Profit Hospital, which made $100,000,000 in the last 3 years. They overcharge blacks VS whites for services and overcharge everyone in general by 538%! 53. I Barely Know Rezko-Only 5 Billed Hours. LIAR--you have known him for 17 years and decided to do a real estate deal with him during a time when he was proven to be under investigation. Despite this, you divided your property and had $300K taken off before the mortgage problems started. Then Rezko’s wife buys the lot beside it that you can’t afford saving you $625,000. 54. My Donations Have Been Checked Thoroughly. LIAR--you only gave back Hsu ($72K) and Rezko (first $66K, then when caught lying $86K, then when caught lying again $150K and now caught lying YET AGAIN OBAMA, it’s $250k) their money when publically called on their involvement in your campaigns. 55. My Church Is Like Any Other Christian Church. LIAR--your church is so extreme, the pastor who married you, Rev. Wright, just got done blaming the US for 9/11 and named Louis Farrakhan their person of the year. 56. I Disagree With My Church All The Time. LIAR--you have yet to repudiate Wright, who married you and your wife and you still donate large sums of money to assist the church in furthering its message--hatred and revenge. In 2006 alone you donated $22,500 to the church you so terribly disagree with. That is nearly $500 PER WEEK-that sure is disagreement, Senator Obama. 57. I Have Clean Connections Despite Rezko. LIAR--you are not only connected to Exelon and Rezko, you are also connected to Hillary PAC supporter Mr. Hsu AND an Iraqi Billionaire of ill repute, Nadhmi Auchi, who ripped off people in the Food For Oil Iraqi deal. Seems Mr. Auchi may have helped Obama buy his million dollar property long before Obama had millions of dollars. Wonder what favors Mr. Auchi expects when Obama leaves Iraq free to be taken over by special interests such as him. 59. The Passport Invasion is a conspiracy to find dirt on me. LIAR–your own Campaign Foreign Policy Advisor is the CEO of the company that looked into your records. PS-You had them look into yours to hide the fact you looked into Clinton’s and McCain’s more than a year before! 60. Rev. Meeks has nothing to do with my campaigning. LIAR--Rev. Meeks appeared in ads for your Senate Campaign, donated to you and helped raise money, then AND NOW. PS-He also seems to despise America . 61. My wife didn’t mean America is ignorant, she was just using a phrase. LIAR–again, MicHELLe’s comments perfectly sync with Wright’s, Meek’s, and Farrakhan’s, both in language, anger, and direction. 62. I am very Anti-Terror. LIAR--[03/30/2008] One of your good pals is long time radical and terrorist William Ayers, with whom you have been seen in the last 12 months and who has helped the now jailed Khalidi, Professor at Columbia who invited Ahmadinejad to the University, to raise money for Palestinian terrorism attacks against Israel. PS-Your church published a pro Hamas Manifesto - guess you weren’t there on THAT Sunday either? How lucky for you. 63. I have the best plan to cure the Mortgage Crisis. 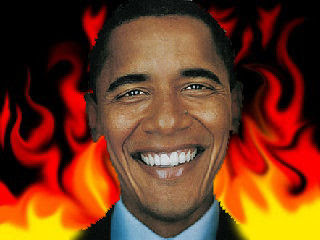 LIAR--[03/30/2008] You and your campaign buddy Penny SubPrime Bank Collapse Prizker have had your little fingers full of subprime cash - Obama has taken $1,180,103 from the top issuers of subprime loans; Obama received $266,907 from Lehman; $5,395 from GMAC; $150,850 from Credit Suisse First Boston; $11,250 from Countrywide; $9,052 from Washington Mutual; $161,850 from Citigroup; $4,600 from CBASS; $170,050 from Morgan Stanley; $1,150 from Centex and last but certainly NOT LEAST-Obama received $351,900 from Goldman Sachs. I am sure that cash all came from folks who knew the subprime loan they had was a dream, eh? 64. I played a greater role in crafting liberal stands on gun control, the death penalty and abortion. LIAR--[03/31/2008] It was found that Obama-the day after sitting for the interview-filed an amended version of the questionnaire, which appears to contain Obama’s own handwritten notes added to one answer. Read Obama had greater role on liberal survey. 65. I did NOT play the race card. LIAR--[03/31/2008] Obama was the first to play the race card. According to Philadelphia Inquirer, Quietly, the storm over the hateful views expressed by Sen. Barack Obama’s pastor, the Rev. Jeremiah Wright, has blown away the most insidious myth of the Democratic primary campaign. Obama and his surrogates have charged Sen. Hillary Rodham Clinton has deliberately and cleverly played the race card in order to label Obama the black candidate. 66. I did not take money from oil companies. LIAR--[03/31/2008] THE FACTS: True enough, Obama does not take money from oil companies. No candidate does. It is illegal for corporations to give money to politicians. Corporations do, however, have political action committees that collect voluntary donations from employees and then donate them to candidates. Obama doesn’t take money from PACs. He also doesn’t take money from lobbyists. But he does accept money from executives and other employees of oil companies and two of his fundraisers are oil company executives. As of Feb. 29, Obama’s presidential campaign had received nearly $214,000 from oil and gas industry employees and their families, according to an analysis by the nonpartisan Center for Responsive Politics. Clinton had received nearly $307,000 from industry workers and their families and Republican Sen. John McCain, the likely GOP presidential nominee, received nearly $394,000, according to the Center’s totals. Two of Obama’s fundraisers are Robert Cavnar, the chairman and chief executive of Houston-based Mission Resources Corp., and George Kaiser, the president and CEO of Tulsa-based Kaiser-Francis Oil Co. Source: Associated Press via Yahoo News. 67. I don’t think my church is actually particularly controversial, Obama said at a community meeting in Nelsonville, Ohio, earlier this month. LIAR–Yesterday, he told a different story. “Did I ever hear him make remarks that could be considered controversial while I sat in church? Yes,” he said in his speech yesterday in Philadelphia . 68. Look at my education record in Illinois. LIAR--In reality, Obama never really championed the local councils. He supported them behind the scenes and only eventually came out publicly on their behalf. When he did weigh in, he came down on the wrong side of the debate against protecting principals from unwarranted dismissals and in favor of keeping councils independent, no matter what. 1. Obama claims special birth. Much more so than we might believe. Reports emanating from Africa allege his mother was in Kenya with his ARAB Kenyan (NOT Black Kenyan) father--this is clearly shown in Kenyan Govt. Registry documents which list the father as an Arab Kenyan--at a very late term of her pregnancy and was not allowed on a flight to return to HAWAII . She gave birth to him in Kenya , immediately got on a plane and then registered him as being born in Hawaii. 2. He is NOT an African American but an Arab American and cannot claim African minority status, which by US Federal regulations require a person to have 1/8 (one eighth) of the minority blood (12%). He has had to duck and weave all his life and use whatever lies he could use to even pass for black and the benefits this minority status provided. So even this, while understandable-is a documented LIE. 1. Word has been out in the Islamic community worldwide for some time (especially Indonesia and Malaysia) to begin overt support for Obama. 2. We heard rumors the Islamic Republic of Iran is also passing the word to their American agents and clerics to support Obama but had nothing tangible till now. 3. The photo above was taken during the last week of March, 2008 by an AntiMullah person who happened to see this woman and was delighted to have a camera on hand. 4. Don't be misled by there only being one person. Mosques have been told to get the message across effectively rather than to hold demonstrations since there was no protest involved where numbers rather than a "bilingual" sign become important.